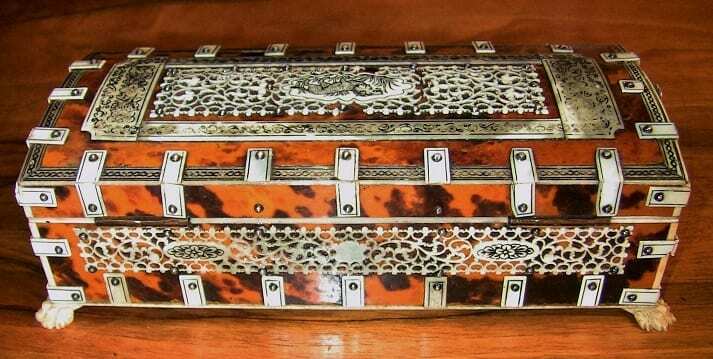 19C Anglo Indian Vizagapatam Shell and Bone Trinket Box. 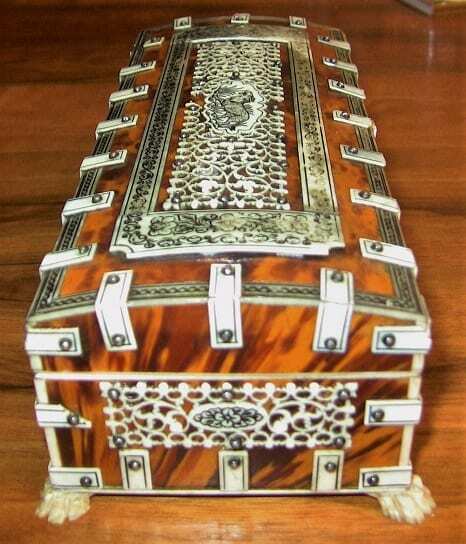 LOVELY 19th Century Anglo-Indian Trinket Box from circa 1880. The box is constructed of sandalwood but covered in gorgeous faux blonde tortoiseshell and faux ivory banding and carved frieze panels on all sides, including the domed lid. 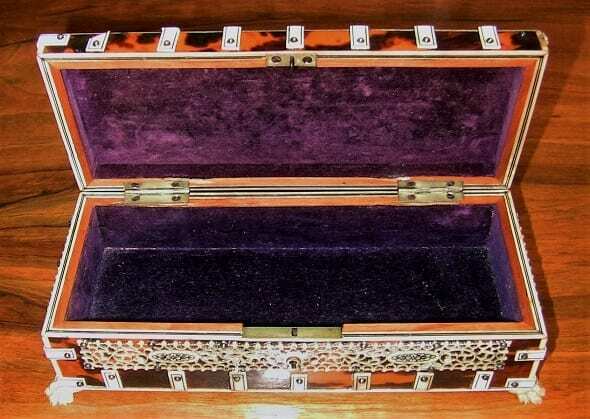 The interior is covered in its original purple velvet lining. This box is in SUPER condition for its age and delicacy !!! 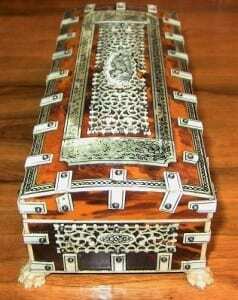 The box sits on 4 carved bone lions paw feet. The early 19th century horn boxes were made in very robust architectural shapes. They often had stepped or canted lids of radiating reeded segments culminating in turned and fluted finials. They stood on turned feet, which showed up the form to full advantage. By the middle of the century shapes became simpler and smaller, sometimes domed, covered with flat horn veneer. They were decorated with fretted or incised ivory strips affixed with ivory pins. From the early 18th century Vizagapatam in India was a leading centre for wood and ivory work, where craftsmen produced fancy furniture and novelty wares specifically for western consumers.